You know those places that you walk or drive past almost every day, but you’ve never ventured in because you’re always on your way somewhere? 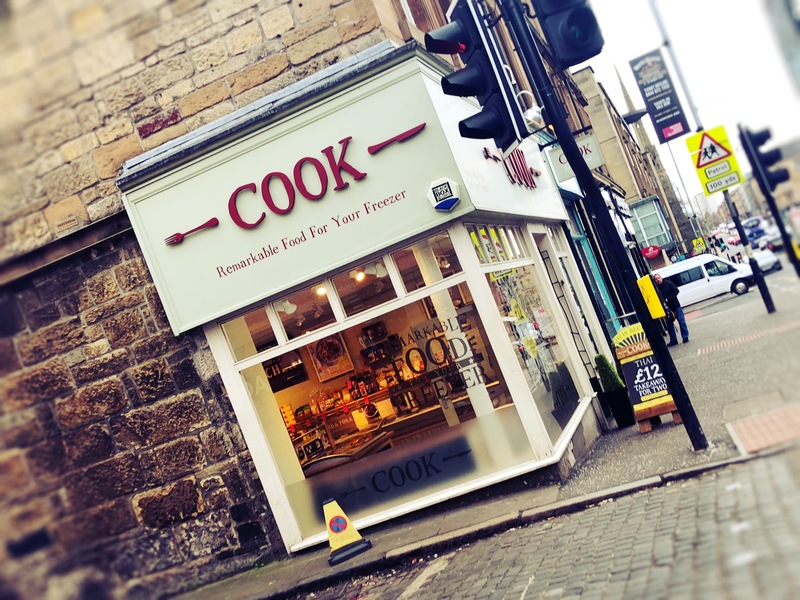 Well, for me, Cook on Great Western Road was one of those places. I was intrigued by it and had thought to myself probably hundreds of times on my way past, “I really need to go in there for a look”. But I never made it. Then a little while ago we were invited to come along and try out some of their products. 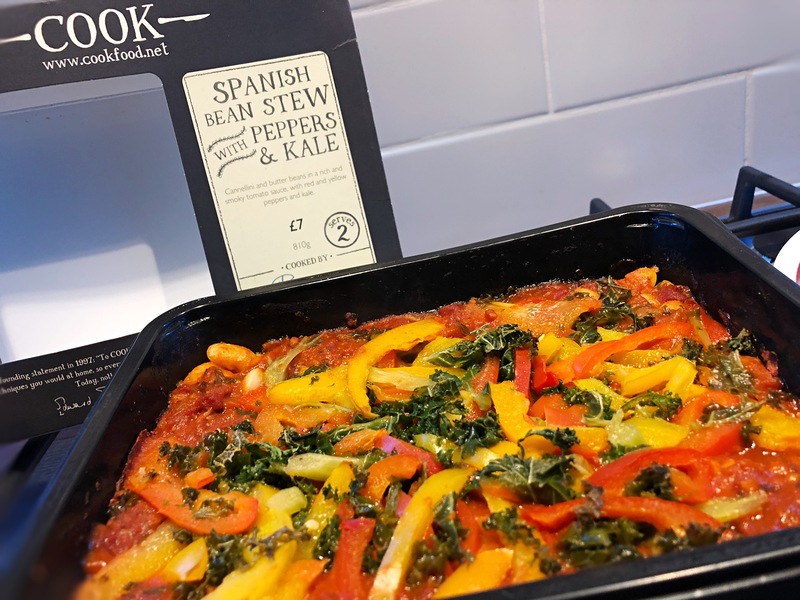 We were moving house at the time so obviously I jumped at the chance to have some tasty family meals that I could just stick in the oven. Anything to make life a little bit easier in the melee of boxes and cleaning and sorting…! What is Cook? I didn’t really know either until I went in. In a nutshell, it’s a shop full of frozen food, all ready for the oven. Now I know that the phrase ‘ready meals’ brings back memories of that weird coloured curry you had a while back which contained 2 bits of meat and a token piece of onion. Well the food in Cook is not like that. At all. All the food in Cook is made like you’d make it at home, using the same ingredients you’d use. No preservatives, no additives. The shop on Great Western Road has so much choice packed into it. 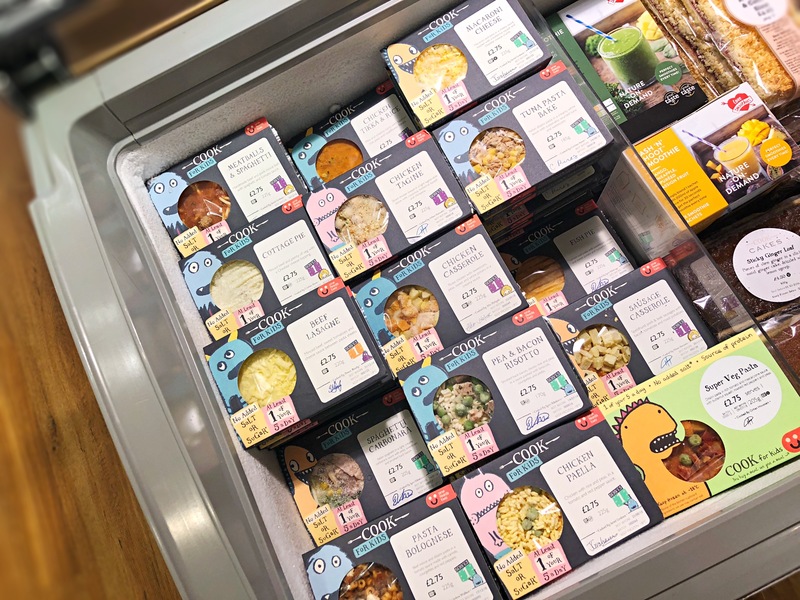 They offer a huge range of meals: Indian, Thai, oh so many pies, pasta bakes, Moroccan, stews and casseroles, lots of veggie meals, Italian, plus lots of seasonal dishes (their summer salad range is AMAZING) including Christmas dinners at that time of year. They also do food for dinner parties, buffets, and some absolutely stunning desserts which, come our first big dinner at ours I will most definitely be using! Their kids range is huge too. To be honest, I loved just looking around in the shop! 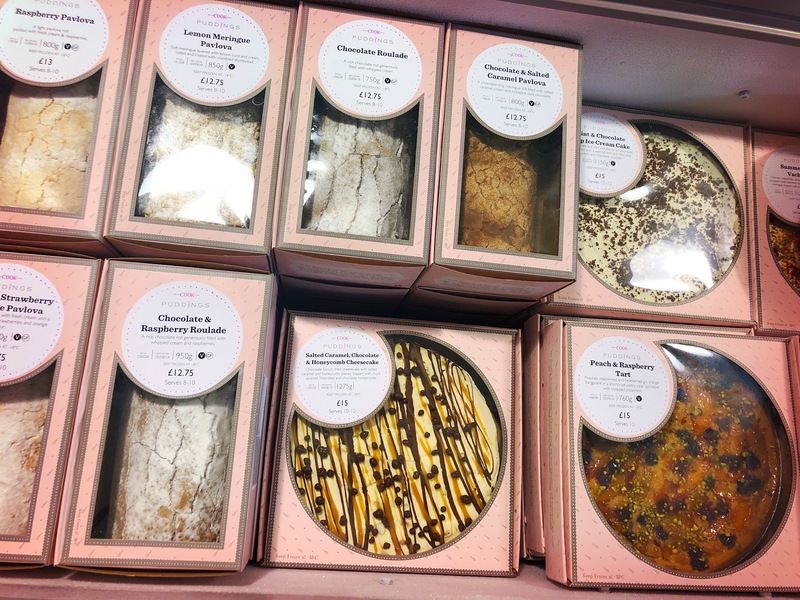 They also have lots of cupboard foods too, to go along with any meals you’re making. We had a few meals for us adults. 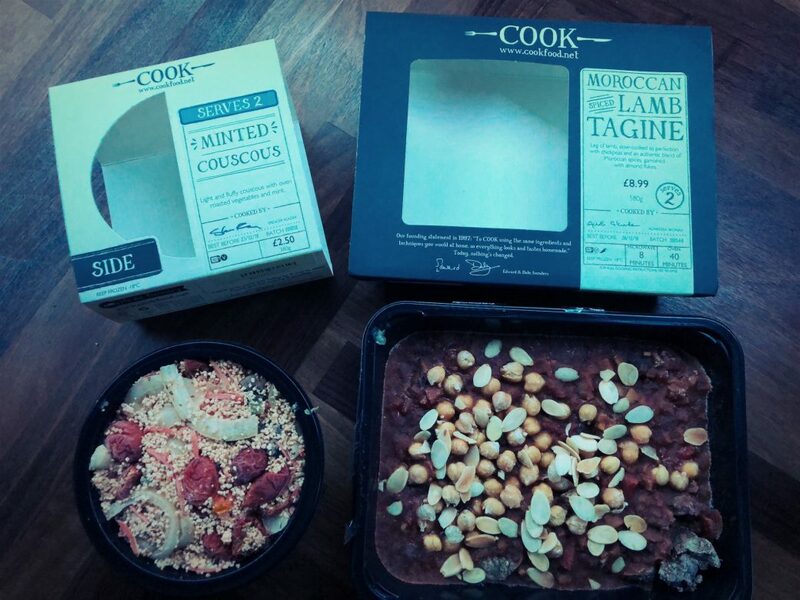 First up was a lamb tagine with a side (for 2) of minted couscous (I say a side but the portions were huge). This was the first of the Cook meals that any of us had eaten and I really didn’t know what to expect. But I enjoyed it from the first bite. 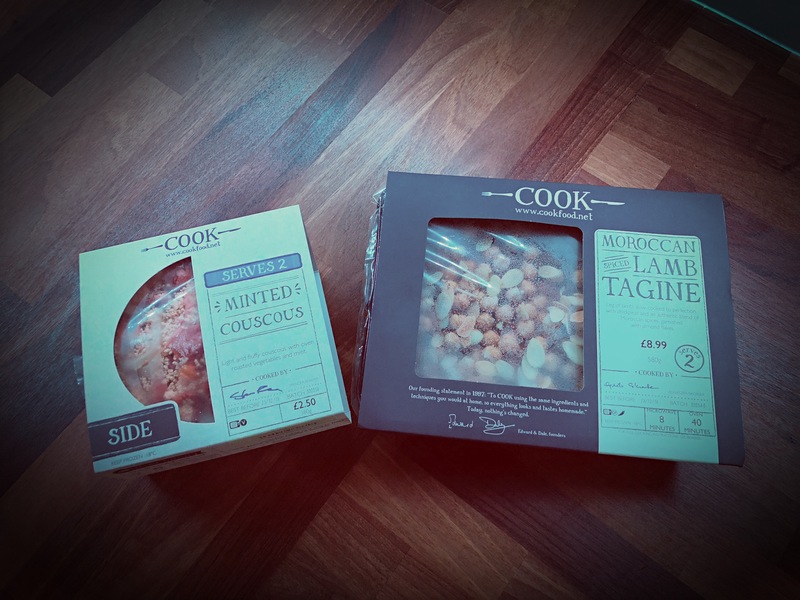 Both the tagine and the couscous were so tasty, and they were perfectly cooked (not that I can take take any credit for that – thanks though Mr Oven). Best of all I didn’t need to do a thing, except turn the oven on and stab the packet a few times. The tagine was to serve 2, and along with the couscous side it absolutely filled our plates. We were very well fed that night. We loved the veggie Tuscan bean stew with kale which we had with some garlic bread (just some we bought from the supermarket that day). This was one that the lovely staff in the store had recommended. I’m not a huge fan of kale but honestly, this bean stew was so delicious. It was probably my favourite of all the 3 meals. There were loads of veggies packet into the stew which surprised me since the few ready meals I’ve had in the past mainly just consisted of sauce! 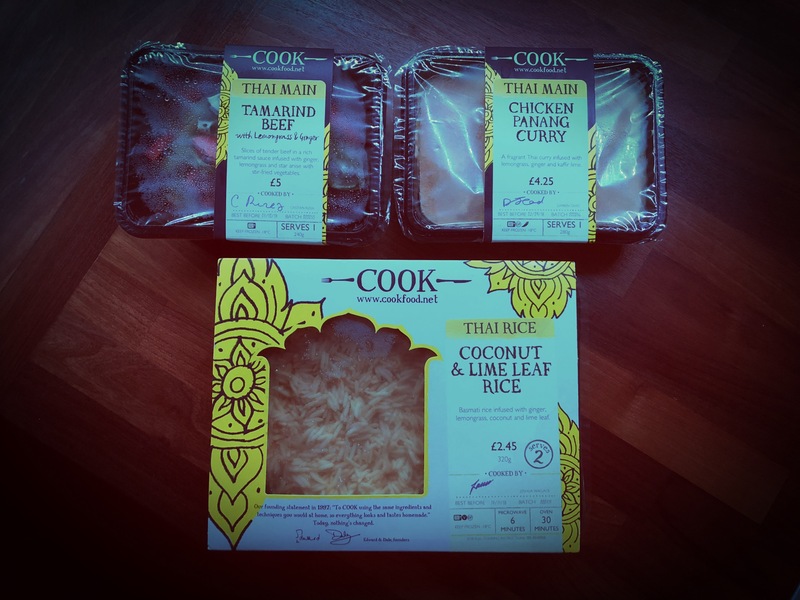 Finally we had the Thai “take away” which was 3 curries and a rice. Again, a lot of food between the two of us. We had the beef massaman (I chose this one for husband as it’s one of his favourites), the chicken panang and the tamarind beef, plus a jasmine rice. We ended up having two of the curries with the rice that night, and the third one a different time, simply because there was just loads of food! For the kids I picked some dishes that I wouldn’t normally cook myself; things that take more time or effort (or both!) than I normally have. These were a fish pie, sausage casserole, lasagne and a tagine. They shared all but one of them (I gave them some veg or tomatoes and some garlic bread with them) and the little lady had one to herself. Every time I served them up, they devoured them. They do love tomatoey food so as I expected their favourites were the lasagne and the sausage casserole. They ate every single bite of those ones and would’ve probably eaten a whole one themselves. Dishes are priced individually. The kids meals are £2.75 each but there are usually deals on so right now it’s 5 for £12 on those. 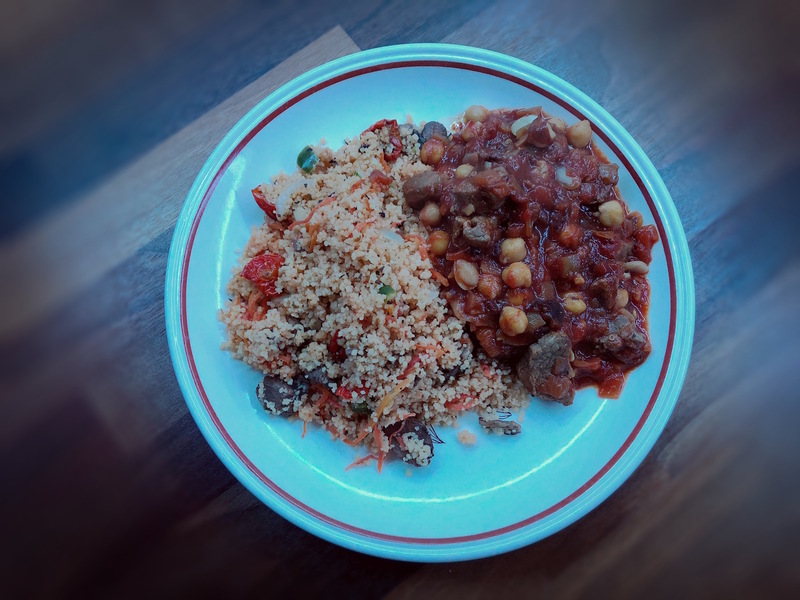 The bean and kale stew is £7.50 (serving 2 people) and the tagine £8.99 and minted couscous £2.50 (both serving 2 people). The Thai takeaway we had was 3 curries and a rice for £12 at the time. 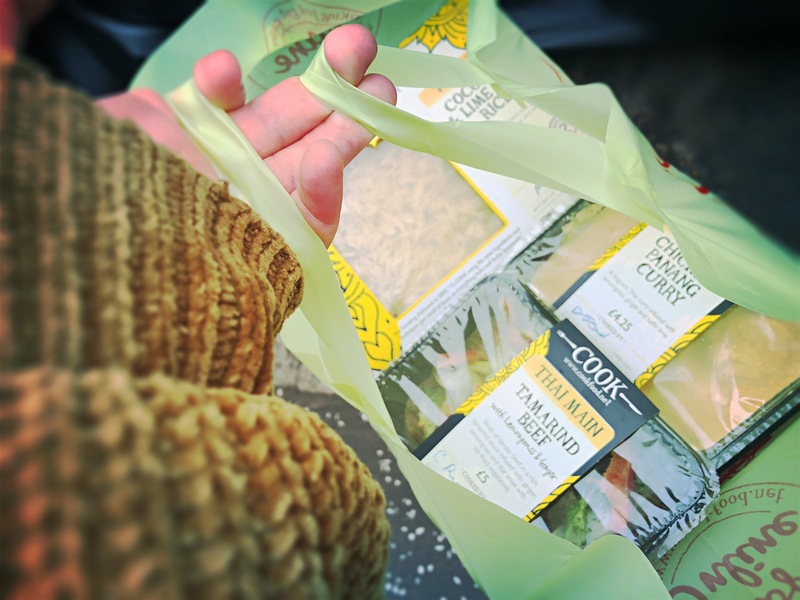 We were genuinely surprised by the meals we had from Cook, because they were all so tasty. The meaty dishes have plenty of chunks of meat in them and the veggie dishes are stuffed to the gunnels full of vegetables. They were all perfectly cooked (following the instructions!) And they honestly were so delicious. 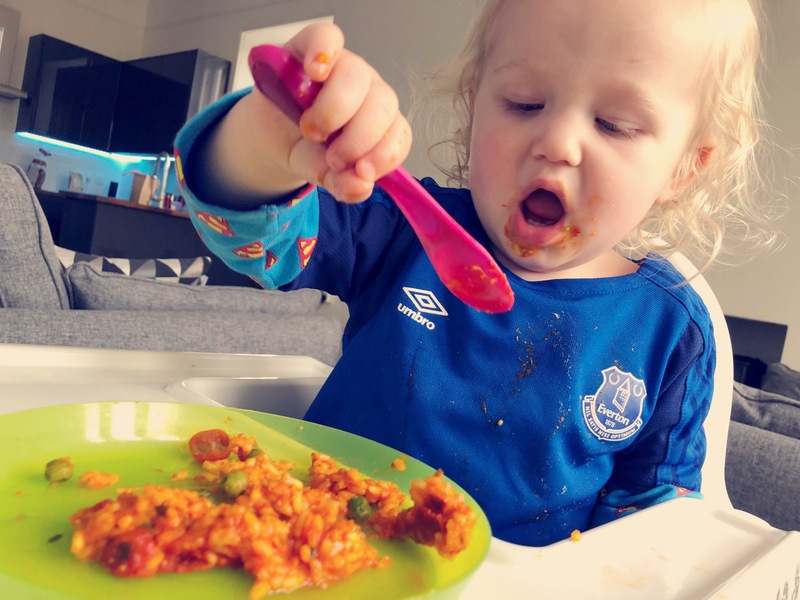 I always try to have a wee stockpile of food I’ve cooked for the kids in the freezer – stuff that I know they’re likely to eat regardless of how tired or distracted or grumpy they are. Now I’ll make sure I always have a couple of these spare too.